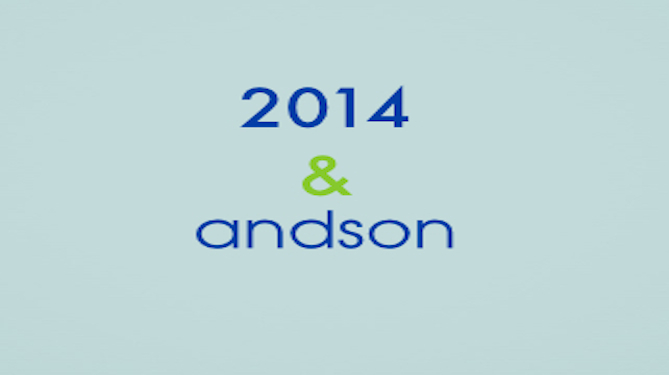 Dear Friends: All of us at Andson, Inc. would like to take this opportunity to wish you all the Very Best for 2014. We are so very proud of the many milestones we reached in 2013. And we thank all of our Supporters and Partners who helped us accomplish each of them. We are looking forward to continually working together to deliver our much-needed programs to students across the valley. We kicked off the New Year with the most amazing party for our team of Board Members, Tutors, Admin Staff and our Community Partners on January 11, 2014. A heartfelt Thank You to Southern Highlands Golf Club and Southern Wine and Spirits for their incredibly generous contributions, support and partnership. On New Year’s Eve 2013, we launched our new website powered by Larym Design. Please do take the time to visit and re-visit it, as it is being continually updated with additional details of our activities and services in Las Vegas, Henderson, and Boulder City. Throughout the month of January, our Academic Team will be busy conducting our very own Aims Web Testing for our hundreds of registered students, while continually streamlining and structuring the Homework Help and Tutoring at our eleven locations in Clark County. At the same time our Financial Literacy Team will be delivering January’s Financial Literacy Lessons to all 25 classrooms at Bracken Elementary School. We continually strive to utilize the most current materials, so lessons are revised on an ongoing basis. We thank our partners, United Way’s YPS, Silver State Schools Credit Union, and Bracken Elementary School for this successful collaboration. Additionally, the Team is gearing up to start the second series of our Financial Literacy Workshops at Desert Oasis High School in the latter part of January. Approximately 1,200 juniors and seniors will benefit from these lessons. Early February, the Academic Team will launch our Homework Help and Tutoring Program at Sunrise Acres Elementary School through the City of Las Vegas. We are eagerly looking forward to launching a new pilot of our supplemental after school assistance to the students at that location. Taking on yet another challenge, we are currently developing a GED preparatory curriculum, which will be deployed early this spring. Through a partnership with St. Jude's Ranch for Children, this program will serve young adults currently in transitional housing and/or aging out of the foster care system. Again, thank you all for continued support, and for making 2013 an incredible year of success. Together we will make 2014 an even better year! Just in time for the new academic year, we are elated and honored to be recognized by State Treasurer Kate Marshall and the National Association of State Treasurers for our efforts in fostering Financial Literacy. We have worked, and continue to work tirelessly to develop and deliver innovative curriculums that encourage students to think critically about personal finance. The new school year brings new projects for Andson in the Financial Literacy front and we look forward to expanding our partnerships to give more students access to the knowledge they need to improve their quality of life. “The Andson Orgaization, in part through the efforts of Matt Hirsch, has been a great community partner, complementing the Treasurer’s Office efforts to drive and foster financial literacy education in the Clark County School District. ‘The Piggybank Project’ has served as a model program for helping kids and parents to understand financial concepts, and to encourage money saving habits, while building decision making skills regarding money." As we continue to focus our efforts on behavioral finance, we like sharing stories that are worth reading and can help us put into perspective the real challenge of financial literacy. The following article, written as a letter to parents, not only provides insight on how to teach children financial responsibility at various ages, but it also reiterates the importance of early education and parent engagement. Parents and culture will definitely influence the way children understand money and the habits they will develop and continue into adulthood. When kids can walk, it's time to start saving. Establish the first behavior of saving by teaching your child to drop coins in a piggy bank or a jar. Explain the meaning of the word save. Show the money. Periodically, show the child that consistent saving adds up by regularly tallying up your savings. Take it to the bank. Make a ceremony of taking the child to the bank to deposit the jar of money. Teach them that the bank will give them money (interest) to "store their money." If there is an allowance, it's time to budget by putting savings first. No matter what the size of the allowance is, break it down between what they can spend, and what they have to save. Note: this may be your first financial "negotiation" with your child - start with saving 50%, and settle for 25%. The first large purchase. As your child ages, he or she will inevitably want to spend their entire savings - on one item. The answer is "no." Modify budget into more line items - discretionary spending, mandatory saving, and "saving for the large item." This is where the behavior of "buying within means" is established. "But, I want it now..." This may be the time to develop a new financial concept - borrowing money. That's okay as long as the rules are set, and the "borrower" adheres to them. This is where the behavior of "borrowing within means" is established. "Can I have a credit card?" Response: No, it's too early. We're sticking to the plan above. However, let me teach you about credit cards - after the "eye roll," stick to your game plan. "My friends have credit and debit cards." Response: I'm happy for them. We're sticking to our financial plan, and here's why. 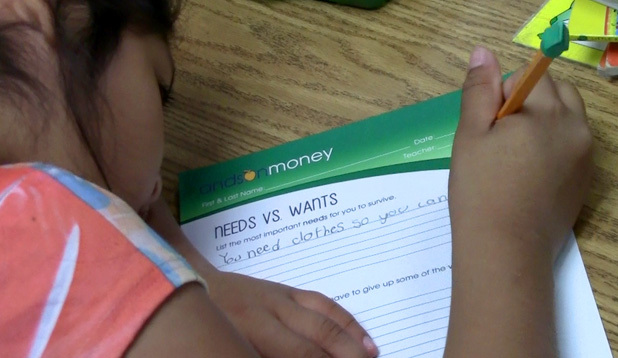 In my own experience, my children were grateful for instilling financial responsibility at a young age. Start early, consistency, monitor progress, and celebrate success - I'm convinced that's the formula for increasing America's financial literacy quotient many times over. Get to the kids. Note: This letter first appeared as an e-Wealth Coach article from America Saves. Carl George is the Senior Executive Partner at Clifton Gunderson LLP, a national CPA firm; past Chairman of the National CPA Financial Literacy Commission of the AICPA, www.360financialliteracy.org and www.feedthepig.org; and the proud grandfather of 9. A statistics professor in my MBA program made a statement on the first day of class, "I can train you how to be a $10 calculator, or I can train you how to think." Obviously, gone are the days of living without smart phones, auto-correct and calculators. So why are we still teaching personal finance as textbook terms and definitions? Why are we spending time on the things that students will inevitably forget; more importantly the things that they can easily look up on their phones? (Please Note: We do worry about many students' capability to spell and do simple math, but that's why we created Andson Academics). We need to teach them that knowledge equals power. When faced with questions about IRA accounts, APRs or the details of an annuity, do some research on Google, instead of believing the salesman. We need to be able to instill that delayed gratification and PYF (pay yourself first) gives them spending choices and spending power. Behavioral Finance is the term that is gaining ever-so-much momentum right now in this field. That is, instead of teaching a student about textbook definitions, let's teach them how to think about finance. What should I be leery of? When does an interest rate raise a red-flag? What are the fees that will be involved? Where can I go for help outside of a payday loan? All of these are examples of teaching young people how to think about their money. Time Business & Money has a great article right now on the concept of changing behaviors instead of just teaching facts. We couldn't agree more and in fact pride ourselves and our programs on providing more than just a workbook or worksheet. Roth, who runs the infamous blog Get Rich Slowly admits that he himself learned all the "basic financial literacy," in his senior year of high school, but was no better because of it. Roth goes on to say that personal finance is something internal for most people - though for many there is definitely a cycle of poverty they need to overcome. What needs to be taught is that in order to make a change, it needs to happen within us. Otherwise it's just like a fad diet - you always end up back at square one. I myself cannot begin to count the amount of times that we see young people that just don't want to end up in the same debtor situations they've seen friends or family end up in. Many times that's enough and it works. More often than not though, one is the sum of their surroundings; so bringing a fresh way of thinking and perspective into the classroom is more important than ever. Let's continue with a mission to change behavior in our students, and not just make them calculators and dictionaries when it comes to personal finance. More Funds For Clark County Schools! Ask yourself, what can children benefit the most from in school? Now, do those benefits need funding? Well, Clark County students will be receiving more funding to help them increase the benefits of their time spent in school. According to the Las Vegas Sun, the Clark County School District received extra federal funding in 2012 after it received $72 million in the previous year. This funding was received through the Elementary and Secondary Education Act of Title 1, which provides more federal funds to private and public schools that have a high number of low-income students. The additional funding is focused on closing the gap between the financial stature of students. Each student will receive $314 on top of the $7842, which is already received. The Elementary and Secondary Education Act of Title 1 can really benefit the children of Clark County. Many children from low-income areas feel that there are more challenges they have to overcome in comparison to those that children from middle or high income areas do. Many cannot even see the light at the end of the tunnel because of the struggles in school. The hope is to change the mindset of these children and allow them to see a brighter future. We, at Andson, want to support these children and hope that the gap between the financial stature of students can truly be closed and every child gets the opportunities that he or she deserves.